Mother of four (hungry) boys, Hanna Geller Goldsmith shares her healthy twist on Maida Heatter’s classic Texas Cowboy Bars. Snacks. They seem to punctuate every activity in our day. The constant desire to eat, regardless of time lapsed since last consuming a mouthful, is a strong inherited gene. In fact, there are members of my family whose hunger is determined by their watch, not their belly. So, as you can imagine, no activity, outing or play date may be embarked upon without a clearly defined plan as to what will be on hand should anyone be struck down with sudden insatiable hunger. It is the first topic of conversation at the school gates, or on entering and leaving the house. It is like a Pavlovian reaction. Before or after doing anything at all, we must eat. These bars are a firm family favourite during cranberry season, and are perfect for satisfying hunger pangs at any time of day. They are wonderfully tangy and just sweet enough to keep small people happy without an after school sugar overload. 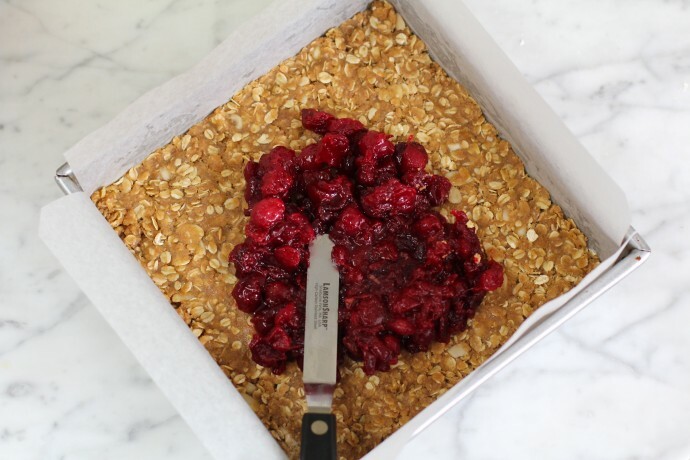 The crispy base is simple and quick to make without the faff of pastry and while cranberries are in abundance I make them at least once a week. As a snack for my boys, they hit the sweet spot, but appease my conscience. These were inspired by Maida Heatter’s classic Texas Cowboy Bars and Martha Stewart’s Cranberry Bars. The cranberry filling is my standard cranberry sauce that is constantly on hand at this time of year (in fact, these bars started life as an answer to a festive cranberry sauce surfeit). I usually double the sauce recipe below and use half for the bars and keep the rest in the fridge, where it will live happily for a few weeks and is delicious not only with turkey, but also with chicken, salmon or on a cheese sandwich. This recipe uses plain and wholewheat spelt flour – an increasingly popular (and now readily available) grain, which many find more easily digestible and believe to pack a greater nutritional punch than regular wheat flour. It is, however, still a wheat varietal and is unsuitable for cealiacs or those who are gluten intolerant. I have also made these successfully with gluten-free flour and plain flour, so feel free to play around. I use a 23cm square tin below but an equivalent size oblong tin or high-sided baking sheet is fine as you will be cutting this into squares. Rinse cranberries and put in a saucepan with the remaining the ingredients. Simmer gently until the cranberries ‘pop’ and break up, around 5-10 minutes (if using frozen berries this may take longer). Stir well and remove from the heat. Preheat oven to 180 C (350 F) and line the base and sides of 24cm (9 1/2 inch) square tin with parchment paper or foil. Hanna Geller Goldsmith is an interior designer and food writer. She has four boys aged 10, 8 and 6 and a baby of eight weeks. Her perfect winter Sunday is a house bustling with family, friends, tea and cakes. Follow Hanna on Instagram/Twitter @buildingfeasts and read her blog.